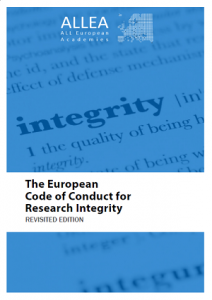 With the support of the European Commission’s Translational Services and ALLEA Member Academies, a new set of translations of the European Code of Conduct for Research Integrity was published in June 2018. The new available translations include Albanian, Bulgarian, German, Greek, Estonian, Lithuanian, Swedish and Turkish. These and other translations of the Code of Conduct can be found here. Throughout the year, ALLEA will be publishing translations of the European Code of Conduct for Research Integrity in all official languages of the European Union, as well as selected languages from around the globe. A correspondence by the lead author of the revised ALLEA Code, Maura Hiney (Royal Irish Academy), was published in Nature on 25 April 2018 calling for making codes for research integrity more practical.